Access physical activity grades, report cards and other related documents from all Global Matrix events in which Venezuela has participated. Marianella Herrera, M.D.Marianella Herrera is a physician who graduated from medical School at Central University of Venezuela (UCV). 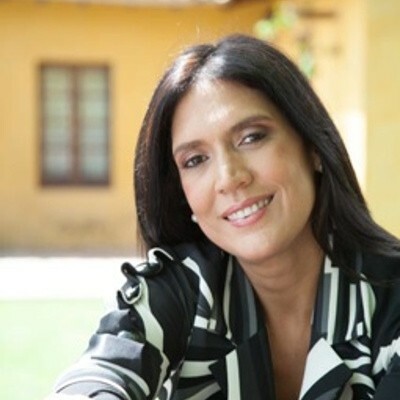 She holds a Master degree in Nutrition and a Doctorate in Human Nutrition, both from Simón Bolívar University in Caracas. She is an Associate (Agregado) Professor and Researcher at CENDES (Center for Development Studies) at UCV where she is part of the team that conducts the line of research: lifestyle public policies and healthy environment for improving health. She was a co-recipient of the Diabetes research award given by Fundación Seguros Caracas (Liberty Mutual Venezuela) in November 2010, and the Service award given by the American Overseas Dietetic Association (AODA), the international affiliate of the Academy of Nutrition and Dietetics in 2010 in Boston, USA. She is and has been the Principal Investigator for several studies related to nutrition, obesity, energy balance and the double burden of malnutrition. Professor Herrera has been publishing and lecturing nationally and internationally on those topics. Her main research interest are social inequities and their associations with chronic diseases, the double burden of malnutrition and its consequences, prevention of obesity and diabetes and design and conceptualization of public policies for improving population lifestyle. 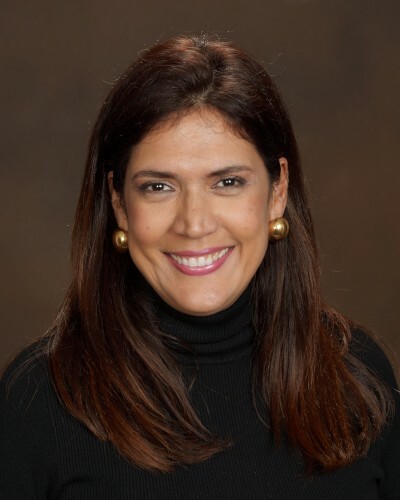 Marianella was an invited professor and researcher during summer 2014 at KU Leuven in Belgium, she currently is the AODA Country Representative-Chair, member of Fundación Bengoa Board of Directors and the president of the Foundation associated to the Venezuelan health Observatory. "It has been a real pleasure working with not only a grest local team but with a wonderful global one, and an extraordinary leadership group including our wondeful mentor. This is a motivation to continue working for the wellbeing of Venezuelan kids as well as for the kids around the world. It allowed us to find hidden "jewels" of commitement and work in the middle of a very difficult environment. I am porud of what can be done with so little, which tells that we need passion to keep the quest for quality of life and wellbeing for all! #ProudtobePartofGLOBALHEALTHYactiveKIDS #PROUDofGlobalMATRIX3.0" - Marianella Herrera, M.D. 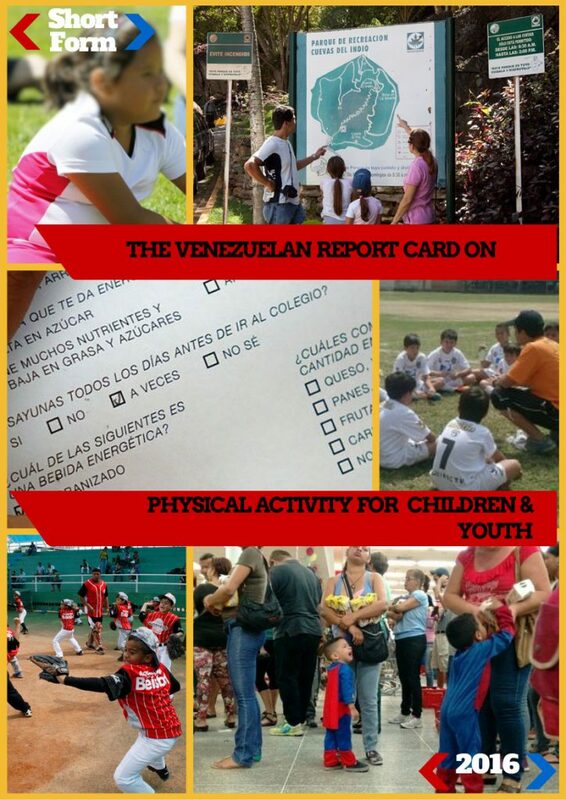 Background: The 2018’s Venezuelan Report Card on Physical Activity for Children and Youth is the assessment of information related to physical activity in Venezuela, and provides an update of existing information throughout the country and assesses how it has been doing at promoting opportunities for children and youth. The aim of this Report Card is to summarize the information available. Methods: Thirteen physical activity indicators were graded by a committee of experts using letters A to F (A, the highest to F, the lowest) based on national surveys, peer review studies and policy documents. Results: Some indicators report incomplete information or a lack of data including: Active play, sedentary behaviors, physical fitness, family and peers and school. These indicators: Overall Physical Activity, Organized Sports and Physical Activity Participation, Cardiometabolic Risk and Community and Environment were categorized as D, D+, D and D- respectively; Active Transportation as B; Government as F; Non-Government as A- and Physical Activities Initiatives for Children and Youth with Disabilities as A+. 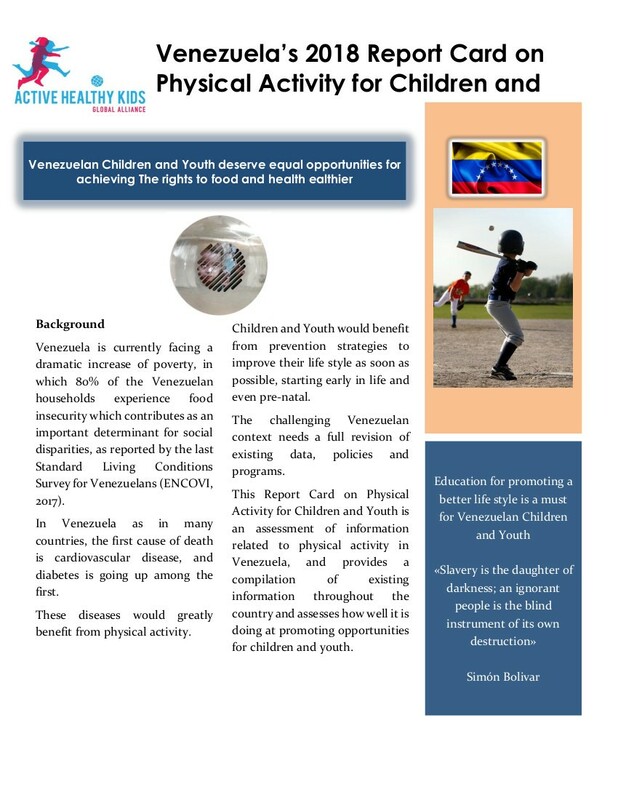 Conclusions: The majority of Venezuelans adolescents are inactive. Overall, Venezuelan children and youth are exposed to risks that are modifiable and that would benefit from better implementation of Governmental actions and articulation with private and civil society’s efforts for closing the existing gaps on wellbeing in different population groups. A weekly hour of physical activity is included in the curriculum of elementary and high school years. Building of new spaces for physical activity in low income neighborhoods. Improving base-ball fields across the country. Still, the best iniciative is the NGO Criollitos de Venezuela, for the baseball training of school age children. "An excellent experience, working with a multidisciplinary team toward improving physical activity for children and youth in Venezuela during challenging times. Obstacles are the best opportunities to flourish, to find what can be improved and prepare for a successful future." - Marianella Herrera, M.D. Background: The Venezuelan Report Card on Physical Activity for Children and Youth is the first assessment of information related to physical activity in Venezuela, and provides the compilation of existing information throughout its territory, and assess how the country is doing at promoting opportunities for children and youth. The aim of this paper is to summarize the information available. Methods: Thirteen physical activity indicators were graded by a committee of experts using letter A to F (A, highest to F, lowest) based on a systematic review of national surveys, peer review studies and policy documents. Results: Some indicators report incomplete information or lack of data. The following indicators were classified as A: overweight and obesity; body composition and NGO policies as B; municipal level policies as C; overall physical activity levels and national level policies as D. Peer review local studies were also graded. Conclusions: 63% of children and youth have low PA level. Venezuela needs to undergo a process of articulation between the several existing initiatives, and for said purposes, political will and a methodological effort is required. Investments, infrastructure and opportunities will be more equal for all children and youth, if more cooperation between institutions is developed and communication strategies are applied.